Serve as an appetizer/salad course or serve crostini without the salad for a fantastic appetizer. This is an easy make ahead entrée and if you have leftover meat from Italian Marinated Filet Mignon, this will make a perfect snack or lunch the next day. I am using a Balsamic Vinegar Aged 18 years and can be purchased on-line at www.spicewoodfood.com . The reason for using Spicewood Food Company Balsamic Vinegar Aged 18 Years is that it is like a balsamic reduction which is sweet and smooth. If you can’t find the roasted garlic mayonnaise or would like an alternative, see Chatty Advice. Makes about 12 crostini as shown depending on how thin you slice the fillets. In a large ziplock bag mix together all the ingredients except for the meat. Add meat, remove air, close and gently massage fillets until evenly coated. Pace in refrigerator and marinade for at least 8 hours or overnight if possible. Every so often massage fillets and turn bag to allow all sides of fillet to be evenly coated with the marinade. When ready to grill, heat a grill or grill pan to a medium high heat. Sear each side of fillet for about 4 – 5 minutes that will normally yield a meat cooked to medium rare. If you prefer your meat medium well cook longer. Doneness of the fillet will depend on the thickness of the filet and the type of grill you are using. Once grilled to desire doneness, remove and let rest for 5 – 10 minutes before serving. If serving chilled refrigerate and don’t slice until ready to make crostini. Meat should be at room temperature when serving. Do not let meat sit at room temperature for more than one hour. When ready to serve, slice baguette on a diagonal and spray with non-stick cooking spray on both sides. Lightly toast in a preheated oven at 375 degrees for about 8-10 minutes. Remove and set aside. Thinly slice fillet and set aside. Rinse and pat arugula dry and set aside. Finely chop tomato and set aside. 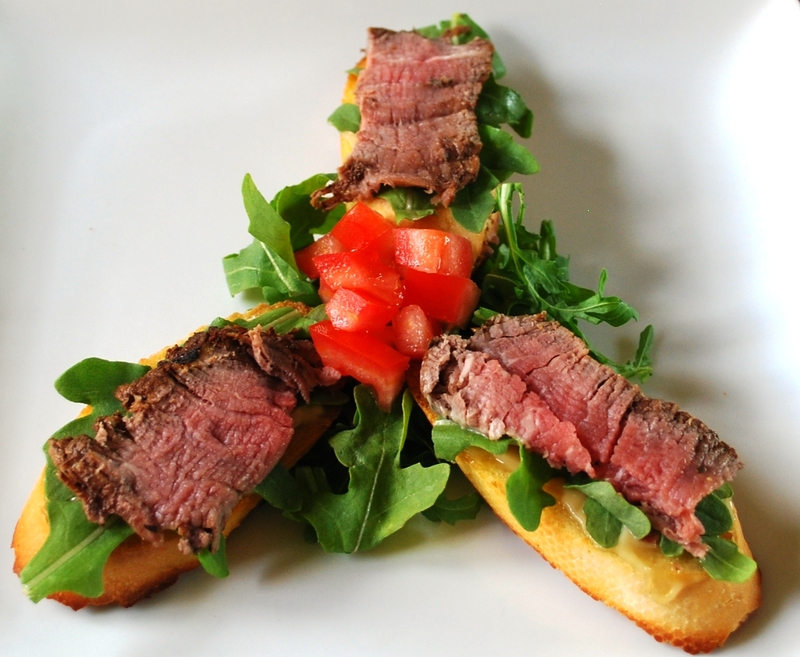 To assemble, smear roasted garlic mayonnaise over the toasted bread, add several leaves of arugula and top with a thin slice of filet. On a plate add arugula and tomatoes to the center of the plate and top with crostini as shown. If desired drizzle arugula and tomatoes with a tad bit of extra virgin olive oil. Try Beringer Founder’s Estate Old Vine Zinfandel (California), Bogle Vineyards Old Vine Zinfandel (California) Anthropology Pure Estate Shiraz Sustainable Farmed (Central Ranges, Australia) or Rosemount Shiraz (Australia). If you can’t find the roasted garlic mayonnaise, take a garlic clove and rub it over the crostini after it has come out of the oven and spread regular mayonnaise over the crostini. Alternatively roast a head of garlic, add to mayonnaise and blend. Gradually add cloves of roasted garlic to the blender to your liking. Another alternative is to mix horseradish with mayonnaise to your liking and serve over crostini.